Mari Herreras Bob Aros: "We're no different than the person who works in a hospital or drives a bus, yet we're not given the same respect." 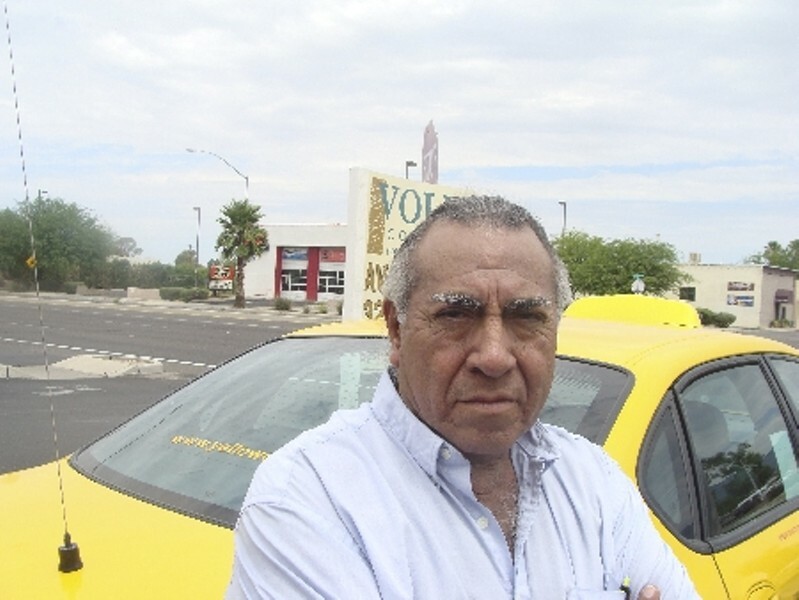 The last time we talked to Christopher Kroh, he was in the early stages of starting a group to organize Tucson-area taxi drivers. Now, a month later, his contract with Yellow Cab has been terminated. Kroh, a taxi driver here since 1996, told the Tucson Weekly he was motivated to start the Tucson Hacks Association (See TQ&A, June 7, 2012) because he saw the job go from being one where you could make a decent living to one where drivers are nickel-and-dimed because of their independent-contractor employment status. "It comes down to this: If we are truly independent contractors, treat us as such, or hire us as employees," Kroh said. "But if we're hired as employees, think of how much money the companies would lose having to pay FICA, workman's comp or health insurance. That's why we remain independent contractors when we really should be employees." Kroh said he was asked to come into Yellow Cab's Tucson office last week to get the news that his contract would not be renewed. The reason given was because of a cab-dispatch business Kroh started this year with the purpose of helping all Tucson drivers not be dependent on the dispatch equipment provided by the cab companies in the cars the drivers lease. The Weekly tried to reach Lyle Wamsley, a AAA Transportation manager who Kroh said terminated his contract. AAA Transportation owns Yellow Cab. Wamsley did not return the Weekly's calls or email asking for comment. Although the Weekly interview from June wasn't discussed during his termination, Kroh suspects the interview had something to do with it, along with him forming the Hacks Association and the dispatch business. Kroh said the Allcabs Dispatch Service he started is based on the idea of radio dispatching, but in this case, all that drivers need to have is a cellphone that takes texts. Drivers who sign up get a mass text asking what zone the driver is in to determine if a driver can take a call. The business would make money charging $2 for each call, but it would be based on minimum fares of $10 for cab customers paying with cash and $15 for those using a credit card. Kroh said his interest in starting the dispatch service was sparked by the 60-hour weeks cab drivers often must put in. Kroh wasn't alone in organizing the Hacks Association. At the group's first meeting, in June, more than 35 drivers and others showed up, including Kroh's friend and fellow Yellow Cab driver Bob Aros. Aros has been driving a cab in Tucson since the early 1980s when drivers were part of Teamsters Local 310, before federal deregulation entered the picture in 1982. Deregulation forced unions out of the cab business and allowed companies to go from hiring drivers as employees to hiring them as independent contractors. Aros said he believes the independent-contractor status violates certain aspects of Arizona law. For example, Aros said that companies cannot require that independent contractors work exclusively for them, because if it is required, then they must be considered employees. If Yellow Cab terminated Kroh based on his starting the dispatch business, the company is violating state law, according to Aros. He said the law requires that employers not provide tools to independent contractors. Therefore, the dispatch equipment in each cab could be in violation of the law, he said. Deregulation has also led to an increase in the number of cabs on Tucson's streets, according to Kroh and Aros, who estimated there are close to 200 now. Their estimate includes gypsy cabs driven by people who use their own vehicles, and small companies not associated with Tucson's biggest cab companies, including Yellow Cab and Discount. In 1982, Tucson cab drivers organized and filed a complaint with the National Labor Relations Board. Although the drivers lost, Aros said the complaint "scared" cab companies into making changes. Before the changes, cabbies weren't told the location of the fare and the destination until after accepting the fare. The companies acquiesced and began giving drivers more details. But 2 1/2 years ago, Yellow Cab took the old dispatch equipment out of its cars and replaced it with a computer-based system that Aros and Kroh believe was put in to better control drivers' actions and fare selection. Aros explained that when drivers sign their contracts, certain attributes are entered in the dispatch system that filter the kinds of calls drivers agree to take. Some drivers, for instance, want only cash calls. Others decline medical-transportation calls, paid through a state-voucher system, because they don't pay as much as regular calls. Others want lots of airport calls. "But airport calls are listed under the same attribute as vouchers," Aros said. "If I want airport calls, then I have to take vouchers. "When it comes to gas and time, it's better for me to sit and wait an hour for one cash call then go out for two voucher calls. I make more." The other issue is a drivers' queue set up in the system. If a driver is on the westside of town and rejects a call for a voucher pickup on the eastside, he is placed at the end of the line and may wait hours for another call. And once a driver rejects 17 voucher calls, Kroh said, the driver is suspended. "It's all set up to make sure drivers take voucher calls. It's the mainstay for Yellow Cab," he said. Aros said it may be time to ask the National Labor Relations Board to intervene again. One glimmer of hope for local drivers is a 2008 ruling by the 9th U.S. Circuit Court of Appeals supporting an NLRB decision that taxi drivers in Oakland, Calif., were company employees, not independent contractors. The ruling allowed them to seek union representation. "Part of the challenge is how the public sees us," Aros said. "There isn't a high opinion of cab drivers. But really, we're no different than the person who works in a hospital or drives a bus, yet we're not given the same respect."